Flattened Bottle Caps in Lots of Colors at Bottle Cap Co.
Color on both sides! Perfect for necklace pendants, magnets and more. Wholesale pricing, discount quantity price breaks, FREE SHIPPING on orders $25 and over! These are standard size bottle caps flattened in a press by a machine. The image/design area is the standard 1". Two sided color Flattened Bottle Caps are also available! 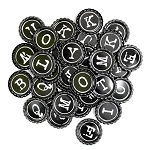 Flattened bottle caps are perfect for jewelry, key chains and unique scrap embellishments. 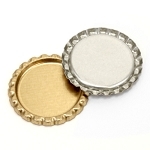 Check out our diy craft and jewelry blog for flattened bottle cap craft ideas!